The slightly curved convex top encourages the proper disposal of litter while helping contain undesirable	odors. Never worry about losing the lid, the hinge flip top has a locking key for optimal security. Inside the 24 gallon receptacle there is a removable, steel liner contoured to precisely fit the unit to ensure no unsightly gaps. This receptacle's conventional design uses vertical slats connected by two horizontal bands that shows off the upper steel mesh detailing. Constructed from head to toe with commercial grade steel this imported unit is then sealed with a durable high quality powder-coating finish. 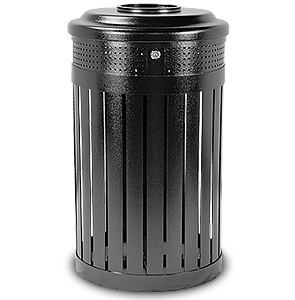 This durable all steel trash receptacle is able to handle rigorous use in high volume areas. Four leg levelers under the base ensures prime stability on un-level surfaces.